To my recollection, never has a modern artist been so in-tune with what their fans deem superb. Certain musicians in recent years have become so preoccupied with releasing marketable songs with provocative videos as singles, rather the finest in their catalogue. With their retrofitted Pop, influence taken from Indie, Psychedelic, Twee, and Jangle, Alvvays tailors their appeal for the highest level of pleasure. Like their inspirations, whether it's Love, The Smiths, or Belle & Sebastian, Alvvays gives their best upfront. A double-edged sword in the cutthroat Internet era, the hype gained from their debuting pre-release singles like 'Adult Diversion' or 'Archie Marry Me' inevitably set fans up for disappointment when those two, along with future single 'Party Police,' represented the best of Alvvays' offering. 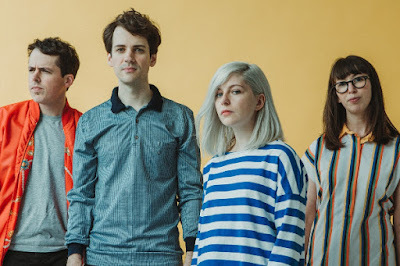 Patterns reveal themselves, as does Alvvays' knack for knowing what's the best of their best, considering this time around the story is undeniably similar. First, there was the scintillating 'In Undertow.' Then 'Dreams Tonite,' 'Plimsoll Punks,' and 'Lollipop (Ode To Jim).' Before the grand scope of Antisocialites reached the consumer, they had already heard the best. Unlike their debut, here the disparity is greater. Antisocialites is a dog day dream, a summer flick for a bygone era of immense nostalgia. I just wish the best scenes weren't all spoiled ahead of time. There's a subtle moment on one of Antisocialites' deep cuts that pinpoints the thematic narration throughout. That's found on 'Already Gone,' a solemn eulogy that's jarringly sandwiched between two picnic day diddy's. It's that positioning, coupled with the sad tale of a teenage drowning, that guides the album's emotional quarrel. Much like how Morrissey (of The Smiths) confronted the glitz and glee of Jangle Pop with girlfriends in comas, meat-eating murderers, and death seen as poetic escape, Molly Rankin's acceptance of the doldrums ("drain the pool, the summer's over") conflates the cheerfulness spreading elsewhere. It's a summer album that acknowledges the grim, thinly-veiled underbelly. Much of this, as we've prone to see in Indie Pop recently with acts like Japanese Breakfast or Angel Olson, centers around waning relationships. Tracks like 'Your Type' and 'Not My Baby' are self-explanatory, as Rankin decries in the former that "I will never be your type" because of "your decrees and conspiracy theories," while the latter experiences the highs of a relational breakup and the careless freedom that offers. On Antisocialites, it seems as if Alvvays' priority is exhuming the headaches during a supposed time of revelry. Her strength goes against the stereotype, but Rankin still presents herself as a hopeless romantic to heighten the sense of saccharine. Her lyrics borrow a lot from the standard practices found during your archetypical 90's Romcom. Down on her luck, stuck in places she wishes to not be, fantasizing about heartthrobs strutting down the sidewalk. The secondary single 'Dreams Tonite' a model example of this, and arguably Antisocialites' best track. The chic and inscrutably polished Dream Pop daydream owes a great deal to Beach House's heyday, as Rankin floats like a feather over the cloudy instrumentation in much the same way Victoria LeGrand did on Teen Dream. Here, Rankin's fantasies evoke that of a teenage metamorphosis, wishing for connections in a dream state because reality's too farfetched. The pluralism of reality versus fantasy a physical sticking point of the LP, as the various social encounters throughout each and every track contradict the very title. Amongst other things discussed before, peer pressure seems to play a significant role as well. It's not obtuse, or even identifiable, but it lingers underneath, as revealed on closer 'Forget About Life,' a funny notion considering all the life that's had on Antisocialites. While Rankin's performance tiptoes the line between blithe and malaise, the production tends to side with the former. Only the aforementioned 'Already Gone' exists in a somber state, not surprising given it's about death. However, elsewhere, while Rankin continues to question the inconsequential decisions of an adolescent's social life on tracks like 'Not My Baby' and 'Forget About Life,' the production vibrantly bounces along. 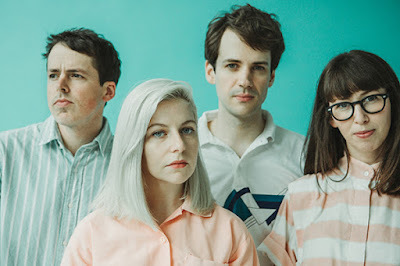 Whether it's the guitars, drums, drum machine, or keyboard, which are virtually the only instruments you'll hear here, Alvvays never shy from their gaga of frivolous Pop. That's best seen on 'Lollipop' and Antisocialites' best non-single cut 'Saved By A Waif.' The former reaches deep into the westernized perception of Twee Pop, quite literally whizzing around like a child undergoing a sugar overdose, while the latter retreats to the Jangle Pop of 90's theme music. If you've seen The Adventures Of Pete & Pete, and more specifically the spreading nostalgia beaming from the cult-like followers, 'Saved By A Waif' joins the club with jollity. There are a few tracks that struggle with identity though, namely 'Hey' and 'Your Type,' both borrowing lightly from the Pop Punk scene but struggling to acclimate to the liberation elsewhere. On the whole, Alvvays' sophomore LP is a rousing success. The question bears asking though, is it better than their debut? Are they capable of more? Is easy, breezy, summer dreamy their expertise and also their peak? Rarely does the Pop scene ask for much, and you'd be hard-pressed to find a more Pop-oriented album than Antisocialites. Molly Rankin's arresting presence as barbie with a heart that's easily tampered with bolsters the nostalgic rush of any Generation Y'ers that may come in contact. The album, barely exceeding 30 minutes, about as fleeting as one's favorite childhood summer. If we're to compare past to present, Alvvays to Antisocialites, what's lost in simplistic melody is gained in savvy instrumentation. They're both instantly likable, endlessly charming, but whereas the debut embellishes the naive and childlike, Antisocialites embroiders the maturity and feelings left over. A hostile need to be cynical told me that releasing the four best songs prior to dropping the LP was a disappointment. In the moment, it is. Months and years down the road, I couldn't care less. Unlike her Indie Pop contemporaries, Rankin rarely wastes her breath, excluding the all-around expendable 'Hey.' This, coupled with Alvvays' knack for the ear worm results in an LP rife with irresistible substance.